Classes and Pricing - Middletown Dog Training Club - Obedience and agility training in Middletown, Ohio. Note: All classes are 6 week courses. Socialization, basic problem solving (chewing, potty training, barking, biting) getting your puppy off on the right paw. For ages 8 weeks to 6 months.. Continuation from Puppy class, with light overview of some dog sports available to train in. For puppies 12 weeks and to 6 mos who have taken the Puppy class. Basic manners, work on attention, sit, down, stay, come willingly when called, walking nicely on lead, and Leave It! For dogs 6 months or older. Fine tuning of Level I, with the addition of heeling, fronts, finishes, and optional Canine Good Citizen's Testing offered at the end of this class, for a $30 fee (includes practice class & testing class). For dogs 6 months or older, and has successfully completed Level I - must have solid sit & down. This class will cover foundations of heeling, open level exercises including retrieves, and utility level exercises such as drops on recall, go outs, and scent articles. There will be optional long sits, stays, downs at the end of each class. Pre-requisite - Level 1 & 2 Obed. or approval of instructor. Special weekly focus by the moderator of a different learning skill. This class is for students who want the most out of their dog, start of off-lead work, hand signals, proofing, preparing to show, and dumbbell retrieve. For dogs 6 months or older, and must successfully pass Level II & have a solid off-lead STAY command. Must have a competition dumbbell (available at J&J Supplies - www.jjdogs.com). Limit 10 students. 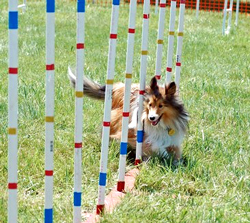 Rally-O, or Rally Obedience combines the fun of dog agility with traditional obedience. There are 3 levels of Rally - Novice, with on-leash exercises that demonstrate the dog's understanding of basic commands such as sit, stay, down, and come and heel position; Advanced, a set of exercises performed off-leash that includes at least one jump; and Excellent, a more difficult off-leash course that includes at least one jump and demonstrates more precise skill and coordination between the dog and handler. Signs instruct teams to go fast or slow, to halt (dog must sit at heel), to make turns and circles, to reverse direction, to do a sit-stay-recall, or to follow other basic obedience exercises. Successful completion of Level 2 Obedience or evaluation. Limit 6 dogs. Using a positive method, introducing tunnels, chutes, weaves, jumps and contact obstacles all at very low heights, target training,and flat work. A solid obedience foundation is required. For dogs 6 months or older. No reactive dogs. Limit 5 dogs. We are not offering Flyball classes at this time. How a specific dog's structure, type and temperament conform to it's breed standard of excellence. Conformation is also referred to as breed competition. Conformation classes will also be held on a drop-in basis for $10 per handler ($5 for juniors or club members). You must RSVP & call us for details. Vet shot records required. Dogs must be one year old or older and have successfully completed a Level 1 Obedience class. After signing the Responsible Dog Owners Pledge, owners and their dogs are ready to take the CGC Test. Items on the Canine Good Citizen Test including Accepting a friendly stranger, Sitting politely for petting, Appearance and grooming, Out for a walk (walking on a loose lead), Walking through a crowd, Sit and down on command and Staying in place, Coming when called. Only $10 testing fee plus AKC title fee (if desired). Open to all dogs(whether or not registered in CGC class). Call for appointment time - 513-424-4442 prior to test date. Do you have an interest in Pet Therapy? Is your dog well trained and enjoys going into new environment? This 6-week class will go over all 13 skills necessary to pass the Therapy Dog International (TDI) evaluation test. Examples of skills include: Walking in a crowd, meeting another dog, reaction to children, Reaction to unusual situations, leave it for people and food. Two classes will be done off site at one of the local businesses for real life experience. Pre-requisites for the class: Successfully complete a level 2 obedience class AND your dog has passed the CGC test prior to the start of class. Dog must be at least 1 year of age to be TDI evaluated. We offer Canine Good Ciitizen Testing by appt. Minimum of 4 dogs to hold class. Call us to reserve next class. TDI testing fee is a separate fee that will be paid on the night of testing. Class are for a weekly 6-week session. You can either download our registration form - and email it to admin@middletowndogtraining.com or just give us a call at 513-424-4442 (leave voicemail message). Classes fill very quickly! Please submit form & payment 7 days prior to class start date. Bring/or send copy of your shot records (DHPP, Rabies, Bordetella) before the first class.Puppies under 6 months must have at least 1 DHPP booster & 1 Bordatella booster before start of class. Alternate PDF file Registration Form – if you cannot download the above form. You must have Adobe Reader installed on your computer to read. These forms are NOT available to fill out online, you must save the form to your device, and send it back to us.